Wednesday means grocery shopping for us – both Whole Foods and Sunflower Farmers Markets have good deals every Wednesday. At Sunflower Farmers Market, their sales run Wednesday to Wednesday, so you get the sales from both ads (“last week” and “this week”) on Wednesdays. Yay! Savings galore! For Whole Foods, their rotisserie chickens are $6.99 instead of $8.99. And it’s their One Day Sale day – one or two items are offered at a ridiculous discount. We picked up a rotisserie chicken tonight for Luis (I’m taking a little break from chicken and beef right now), so I thought I would share a recipe for a delicious chicken salad that I created last month. It’s so quick and easy to make and is super yummy. 3 Tablespoons mayonnaise – I make my own and I make it a little runny. If you use prepared mayo and it’s too thick, combine it with a little white wine vinegar to thin it out a bit. Combine everything except avocado in a bowl and stir to coat with the mayonnaise. 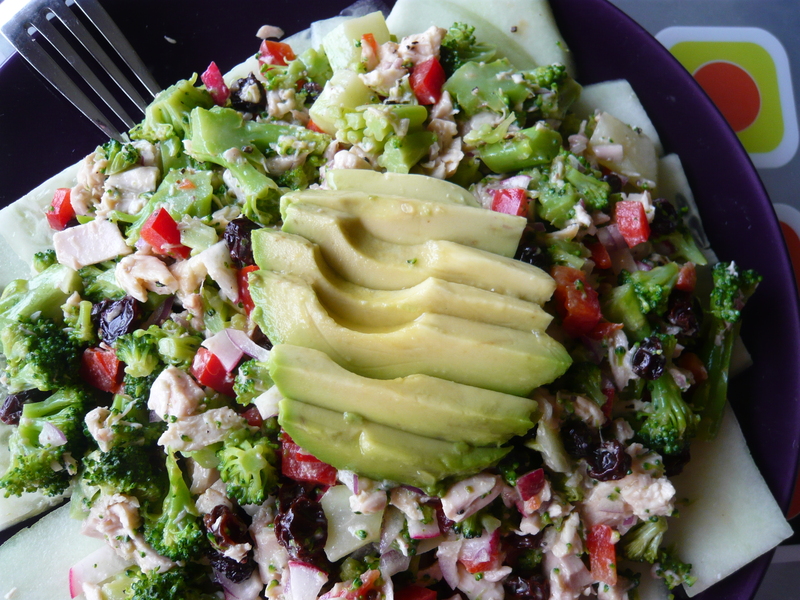 Top with avocado slices and serve! In the photo, you’ll notice that I had lined the plate with long thin cucumber slices, rather than combining the cucumber into it. I did this for two reasons: 1. If we had leftovers, I didn’t want the cucumber getting mushy and gross, and 2. I thought it would work to use the cucumber slices like crackers or wraps and scoop up bits of salad with them. It didn’t work at all. And we didn’t have leftovers. So now I just include the cucumber with the other veggies. 1/2 cup grapeseed oil (the book calls for 1 cup of sunflower oil – use up to 1 cup to make the mayo thicker. Joy of Cooking says that 1 cup is the maximum amount of oil you can use per egg & still have the mayo work. Most recipes will tell you to use a standing blender or food processor to make mayo. I don’t like kitchen cleanup so I just use an immersion blender in a tall plastic measuring / mixing cup (it came with the immersion blender). Start blending and with the machine running, slowly drizzle in the oil. The key is to drizzle the oil in SUPER slowly. I put the oil in a glass Pyrex measuring cup with a spout so that it will drizzle in a nice straight stream. If you use the immersion blender method, have someone hold the mixing cup or be prepared for it to spin around. I just go with the flow and let it spin. The mayo still turns out. Stop when it’s emulsified. Easy! Note – grapeseed oil will produce a greenish mayo. I don’t care. I don’t use mayo often and don’t want to buy lots of different types of oils (like sunflower). Even though grapeseed oil is refined and not ideal, I do use it for baking because the flavor is neutral, so I already keep it on hand. I’ve also made this mayo with olive oil and didn’t like it. The olive taste was too strong. If you have a different favorite neutral oil, use that one instead! I would prefer to use coconut oil but of course it solidifies below 76F, and that seems like it would be weird for a mayo. But I’ve heard that if you use a blend of coconut oil and olive oil, it won’t solidify. Let me know if you’ve tried that! I love this recipe – especially the mayo. I’ve been wanting to make my own and I already have all the ingredients it calls for. Thanks for sharing! Mrs. Lampshade – Thanks for posting! Did you make the mayo? I’ve been wondering how it turned out. Which oil did you use? I recently read that using a food processor or blender to emulsify olive oil into mayo makes the oil bitter – that it needs to be whisked in by hand. Do you have any experience with this?